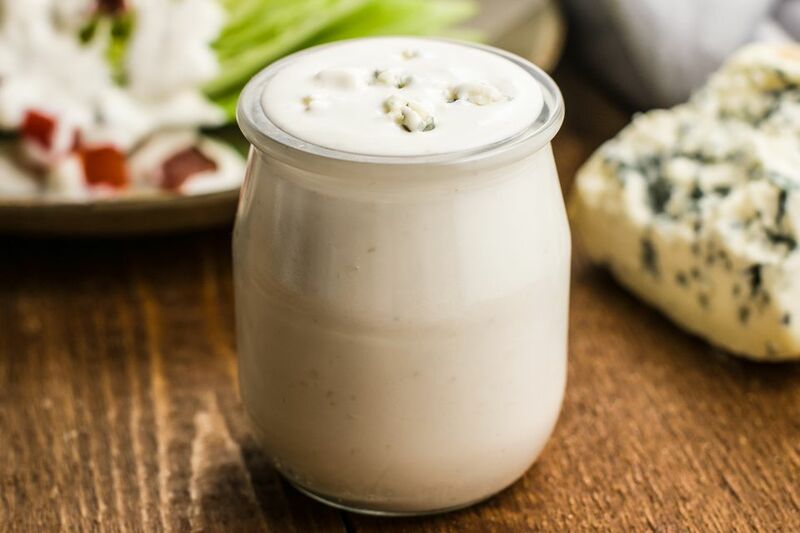 It's incredibly easy to make your own blue cheese dressing, and not only is it much cheaper, but you can also choose which great types of blue cheese to use, such as Gorgonzola or Roquefort. The buttermilk in this recipe gives the dressing a little tang. Whether you're making a green salad, a plate of Buffalo chicken wings, or topping a grilled steak, this blue cheese dressing is a winner - one of the best. Whisk together the sour cream, mayonnaise, buttermilk, Worcestershire sauce, sugar, mustard, garlic powder, pepper, and salt. Once this is thoroughly mixed, stir in the crumbled blue cheese; cover and refrigerate at least 8 hours before serving. Overnight is even better. Taste for and adjust seasoning with salt and fresh-ground black pepper. Serve with Buffalo wings, a salad, or steak. Roquefort blue hails from southwestern France. It's made from sheep's milk, unlike most other blue cheese, and is the strongest flavored. It's soft and crumbly. Stilton comes from one of three British counties: Derbyshire, Leicestershire and Nottinghamshire. It's made from local cow's milk only and has to rise to the standard set by governing boards to be sold as Stilton. It's relatively firm for blue cheese and its intensity falls between Roquefort and Gorgonzola. Gorgonzola comes from Northern Italy and is a favorite in the United States. It is made from cow's milk and has the mildest flavor of the three most prominent blues. Gorgonzola is used as a spread on crackers because of its creamy character. It's also good for melting in pasta dishes and risottos. American blue cheese, while not historically placed in the same category as the big European varieties, is coming into its own. All are made from cow's milk. Some types you might find are Point Reyes Blue (California), Hook's Blue Paradise (Wisconsin), Great Hill Blue (Massachusetts) and Oregon Blue (Oregon). Blue cheese dressing is a guilty pleasure; there's just no denying it. A relatively modest 2-ounce serving adds up to nearly 300 calories and about 30 grams of fat, including the saturated variety. Carbs are light, only about 3 per serving. It adds a negligible amount of actual nutrition, mainly calcium, to your daily diet. These figures vary depending on the actual recipe and might not be exact for any given one.